The Justice for Victims of Police Killings Coalition, along with Concordia’s Quebec Public Interest Research Group, marched on Saturday in a commemorative vigil for victims of police brutality. The coalition is made up of family members and friends of Mohamed Anas Bennis, Claudio Castagnetta, Ben Matson, Quilem Registre, Gladys Tolley and Fredy Villanueva, all of whom died as a result of violent altercations with police. 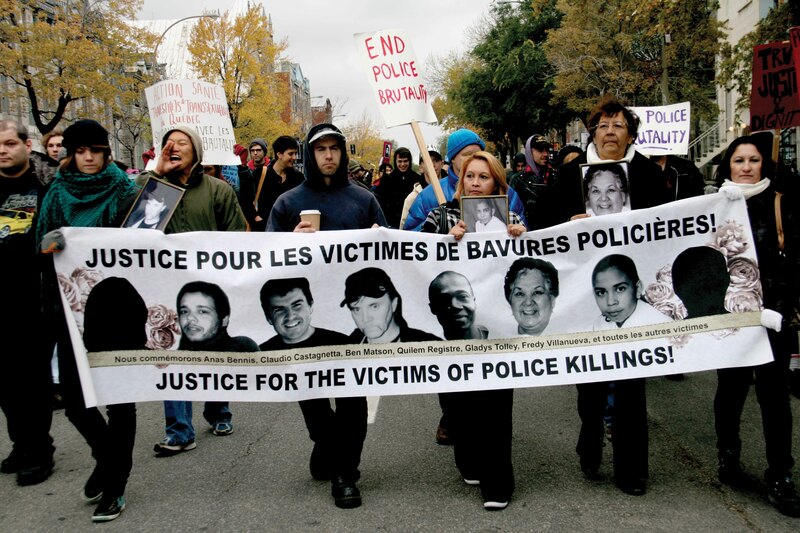 The march started at the FraternitÃ© des policiers et policiÃ¨res de Montreal near Laurier metro station on Gilford St., where speeches were made by the family members. The support committee who helped organize this march is one of QPIRG Concordia’s working groups. “It’s exceptionally important for our staff and volunteers to be here to show support for the people that are fighting for justice and dignity for themselves and families,” said QPIRG member Ashley Fortier. Many people showed up to the event holding posters and encouraging the coalition, as well as a marching band. “The poster I’m holding says ‘How do you sleep?’ and it has a picture of a cop sleeping with a smile on his face. It’s asking what mentality these people have in order to be able to fall asleep at night without dwelling on the things they’ve done during the day,” described one supporter, who did not want to be named. Dominique Clark and Billy Johnson are two Concordia students who attended the march. “It’s a very somber and serious occasion but I feel like we’re making a difference,” said Johnson. Clark, originally from New York, thought police brutality happens more often in the United States than in Canada and said she wants to make people in Montreal more aware of the situation. The march ended with a vigil at Berri Square where family members thanked all the supporters and said some last words. Candles were lit and hot tea distributed to commemorate the victims. “October is a bittersweet month for me thinking about my dad’s birth. Lighting this candle commemorates his birth and his death,” Matson said. “This candle represents a light at the end of the tunnel where justice will be made,” said Tolley.